Jake's journey in art focuses on REUSE. Make your own prints with foam trays in this fun Printmaking lesson. 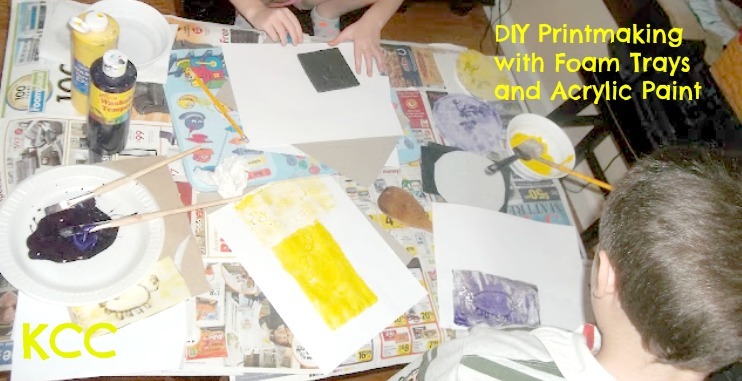 This homeschool art lesson requires only a few supplies making it perfect for homeschool. Enjoy! Animal Prints with Foam Trays Piggy Art. What fun! This is an incredibly easy way to teach the art of printmaking to young children. The assignment required choosing an animal to draw and first drawing it on paper by looking at the image upside down. If you draw an image upside down, you tend to focus less on the end product and more on each individual line. The idea is to make drawing perfectly less overwhelming, when turned right side up, it magically becomes a great drawing! Printmaking Lesson: Messy Craft with Paint and Prints. Hmm... Great theory. Jake drew his pig by copying the image with the right-side up, then he proceeded to complain profusely about how everyone's drawings were better than his. It took a great deal of coaxing to get him to draw the picture upside down. He felt it was a waste of time and "stupid". The battle ensued, he tried it, and the results were similar. That's good news and good news, I think. The good news is he tried it, saw it worked, and wasn't stupid, and the good news is he draws pretty good either way. Foam Trays, Pencil, White Paper, and Acrylic Paint. First, draw a picture of an animal on a piece of paper. Remember, if you are looking at an image, turn it upside down and draw it upside down first. Now, turn your image around, and check out your handi-work. This is practice. The next step is to "draw" the image onto a foam tray. Make sure to press down hard to make a deep indentation into the foam. Now, cut the edges off your foam tray so it is a flat surface. It needs to be completely flat to make the print. Lightly paint your foam image. You can use one color or several. Make a practice print on paper to remove some of the excess paint. Then, carefully place your foam tray paint side down onto a clean sheet of paper. Press firmly, but do not move the tray or the image will smear. With a finger or hand on each end of the tray, carefully lift it from the paper to reveal your beautiful print. Wipe the tray clean, and experiment with new colors. Once they started making prints they didn't want to stop! Tip: The best prints are the ones made as the paint is starting to wear off the tray. This is a great way to make holiday or birthday cards. You can also cut them out and frame them as Christmas gifts.